There are times that you just want to go for something healthy. Whether it is because you want to lose a couple of pounds, or you want to start the day on a healthy note and/or you just want your family to eat and enjoy good healthy food. This is just the recipe for it! Quick and easy to make, and it makes more than enough for you to enjoy for a couple of days. Of course you can double all of the amounts and store it in an air-tight container to use again and again. Heat a large frying pan over low heat. Add the oats, spreading them out into a thin layer. Toast the oats for a minute or 2, then add the coconut oil and salt. Stir to mix everything through and keep toasting the oats for another 5 minutes. Stir occasionally so the mixture doesn’t burn. Now add the maple syrup 1 tablespoon at a time, make sure to keep stirring. Maple syrup can burn easily. 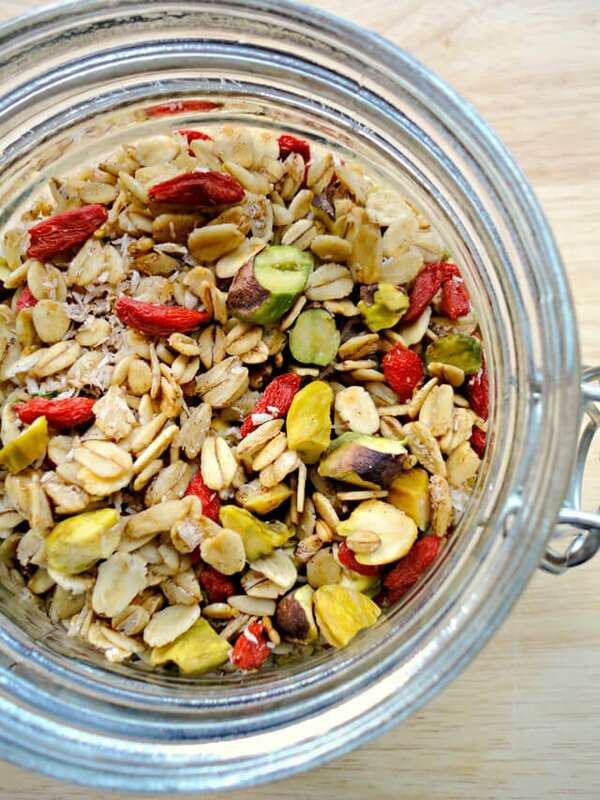 Add the coconut flakes, pistachios and cinnamon. Continue to heat the mixture over a low heat for another 5 minutes. Make sure the bottom doesn’t stick to the pan and burn. 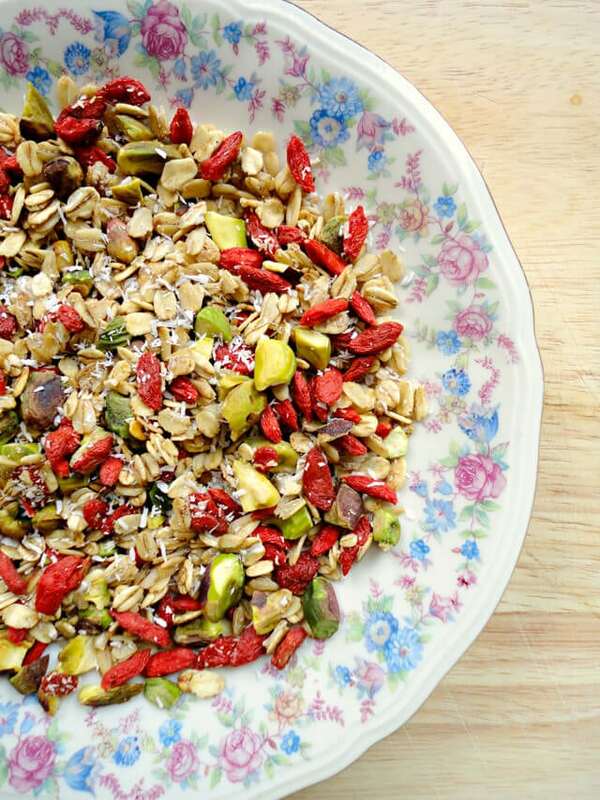 Remove from the pan into a large bowl, and stir in the goji berries. Let it cool and enjoy as a snack, breakfast or lunch with some yoghurt. 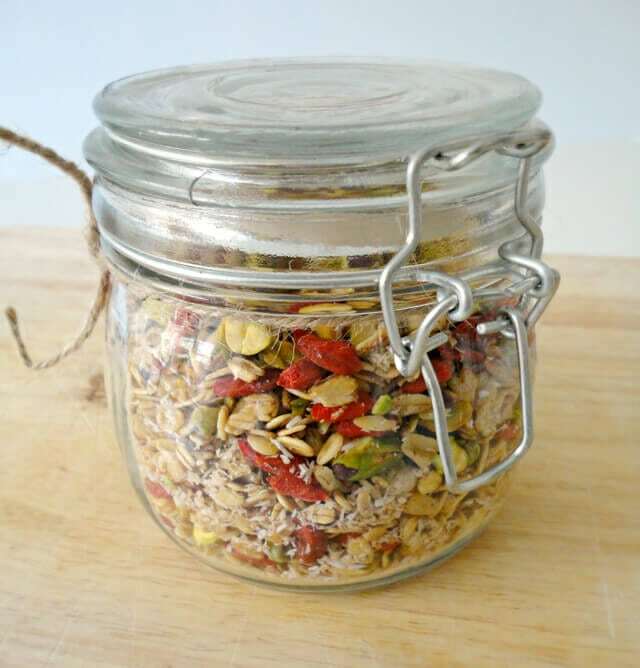 You can also make a small, healthy gift out of it, packing some of it in a nice jar with a ribbon and/or cute label. I’m sure your friends and family will love it! When doubling the amount for this recipe, make sure to prepare it in batches. That way the oats can cook in a thin layer and toast evenly.